Welcome friends! 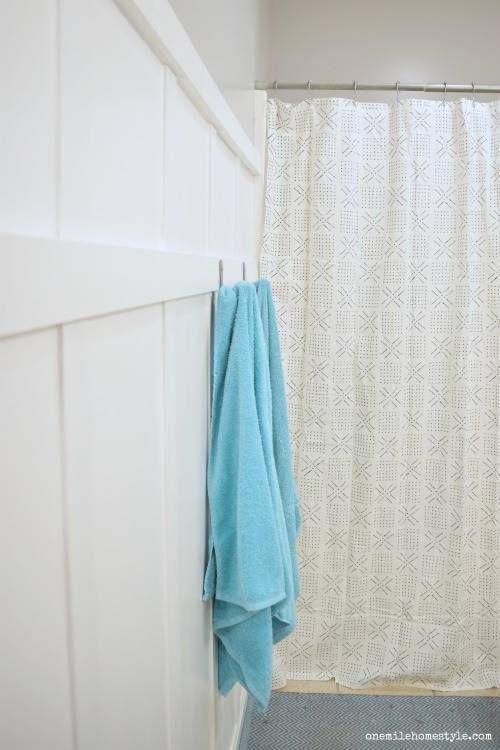 I am beyond excited today to share our guest bathroom makeover, that was completed as part of a $100 room makeover challenge!! 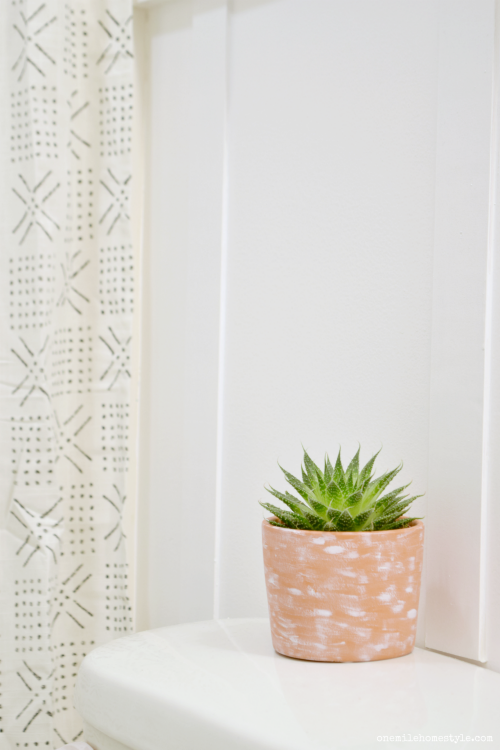 These $100 room makeovers are so fun for me, they are an amazing challenge to use what you have, and really pay attention to your wants and needs for a space. And, let's be real, it's much easier to come up with $100 to update a room than it is to come up with $1,000. Right?! Get your own Free Project Checklist! I chose the guest bathroom (which also happens to be the boys' bathroom as well) because it was just time for an update. Four years ago, I painted this room a bright fun blue for the kids, and to prove that it's okay to use bold colors in small spaces. But, it doesn't really go with the rest of the house, and face it, kids (especially boy kids) can abuse a bathroom! So this room definitely needed a little love. But, I haven't found a money tree yet, so we went all in with a $100 budget, and had to be selective with the updates. I wanted a big impact, and I wanted to be able to add a few accessories too, I did not want to spend all of my money on only a couple of things. Are you ready to see the amazing afters of this bathroom?! Here we go! Gorgeous, right?! So much brighter! And so much more character in this small space! I had every intention of painting that vanity a charcoal grey (leftover from painting our master bedroom), but I simply ran out of time. It's still on the list, and will get done soon! And some day down the road we will update the flooring. This space is so small, it won't cost too much to remove the bad tile, and replace it with something much prettier. 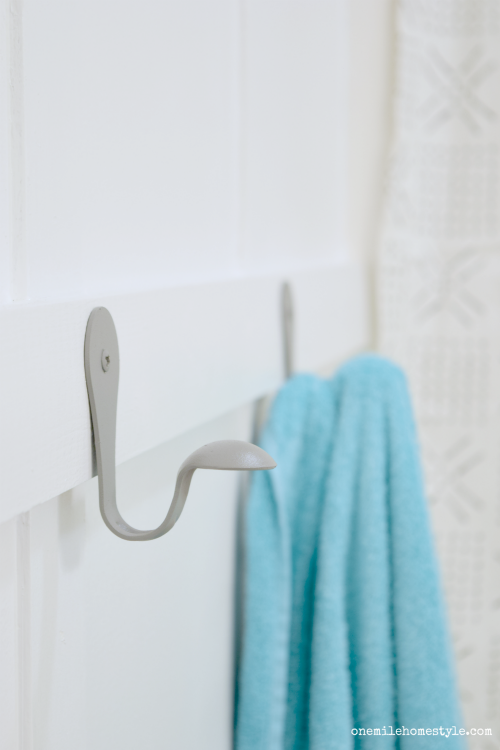 How simple and cute are those towel hooks?! They come in a variety of colors, but the grey was my favorite (no surprise there! ), and the color doesn't take away from the wall detail. 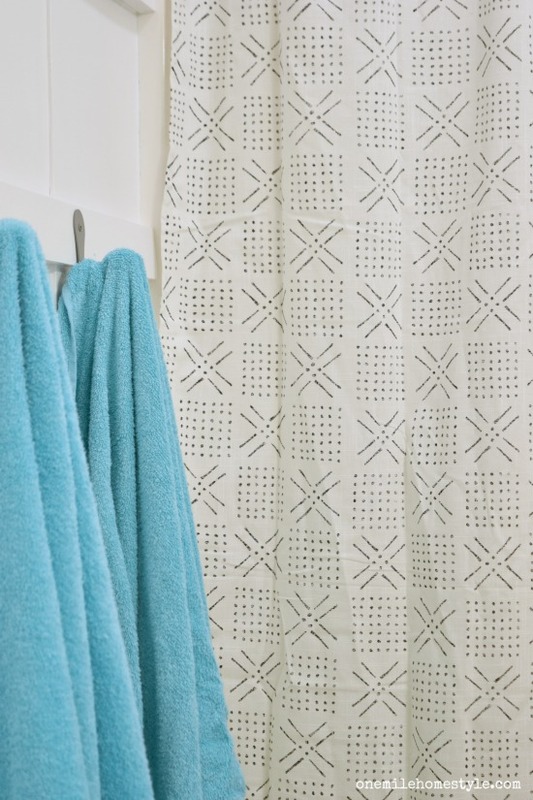 And that shower curtain was a last minute addition, but I had the money, and that pattern was calling to me from the Target aisle, so I grabbed it! I went back and forth on adding some kind of art to the walls, but for now, decided to let the awesome board and batten detail be the star of the show here. Eventually, I'm sure I will add to it, but for now, I am enjoying the simple and clean look of this room with nothing else on the walls. I gotta say, I am so happy with the new look of this bathroom! And the fact that it is a huge change without spend much money is just the icing on the cake. 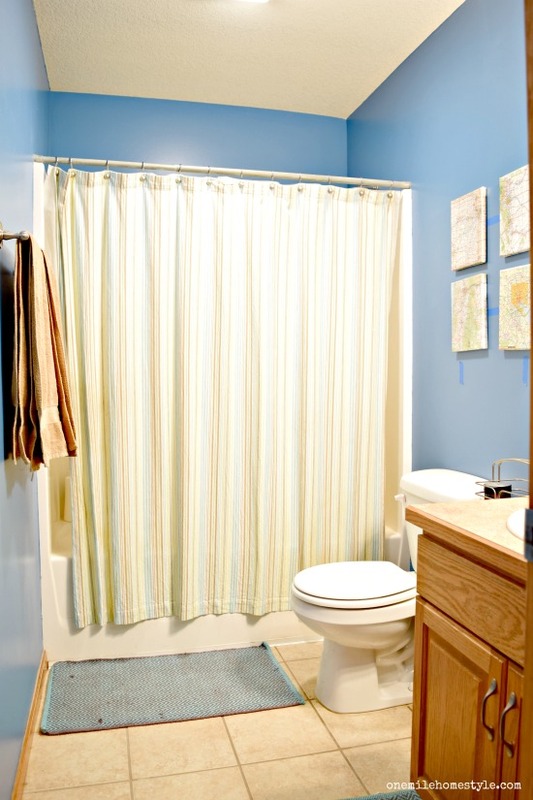 Completing room projects, especially when the budget is tight, requires good planning. I created a Project Checklist to help me keep track of what I had already and what I needed to buy, and then I just clipped the receipts to it to keep everything all together. 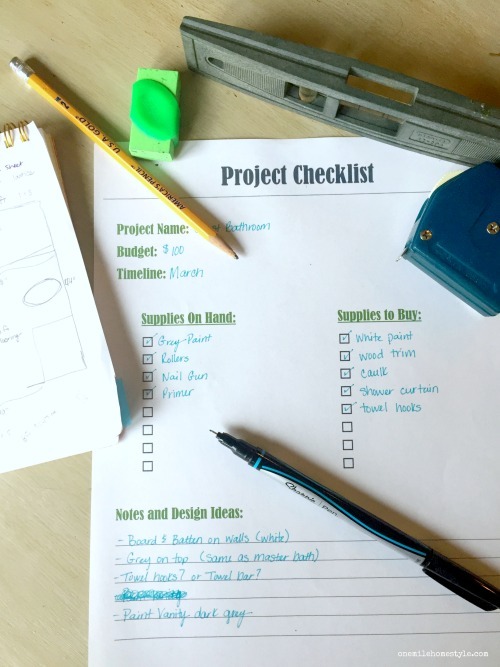 And now, you can get your own Project Checklist, and keep your project organized and on budget! Looking for even more great $100 Room Makeover ideas? Check out all of these amazing projects that my awesome friend completed! Simply gorgeous! Those walls are stunning! Great transformation! Great wall with towel hooks. 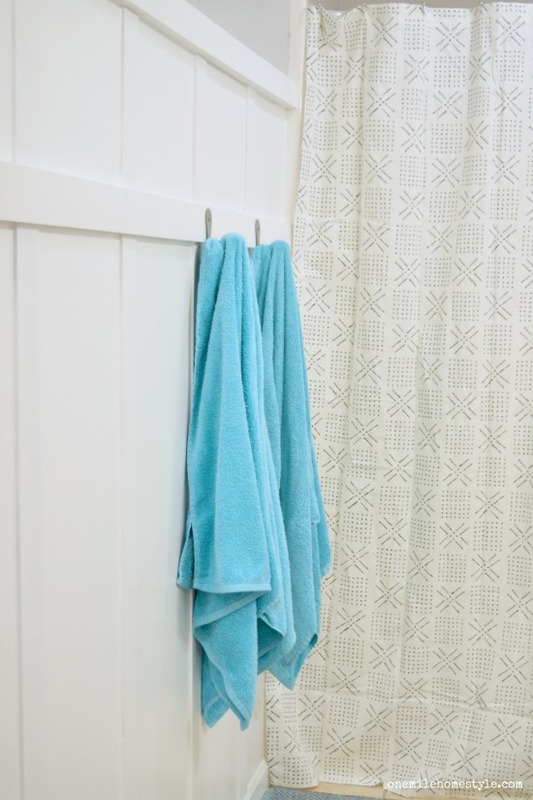 I feel like I should put in wall hooks for my kids and their towels. Maybe that'd hang them up more! Thanks Victoria! I'm hoping the towel hooks mean fewer towels on the floor, we will see if it works!! What a lovely transformation! Great wall and color. 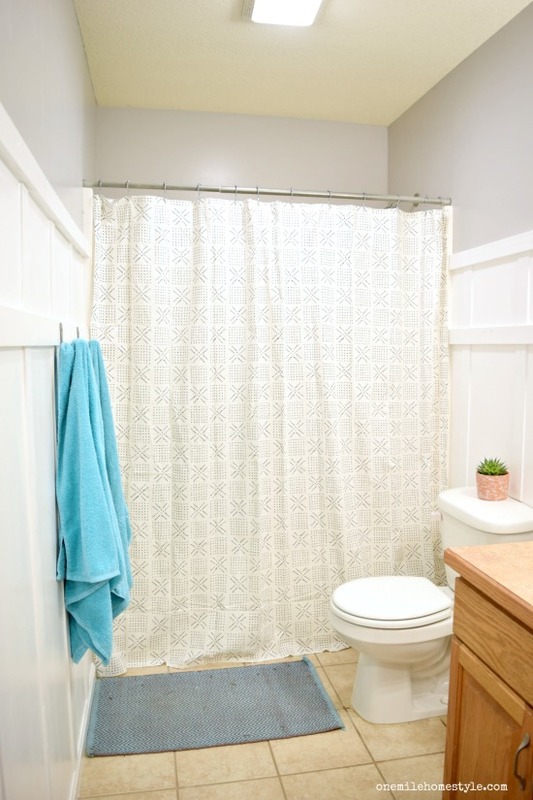 I love the new walls, the color and the board and batten! Love the new shower cutain and those cute hooks too. It's such a huge transformation and so beautiful, great job! Thanks Toni! I'm loving all the little details in here too! Wow!!!! 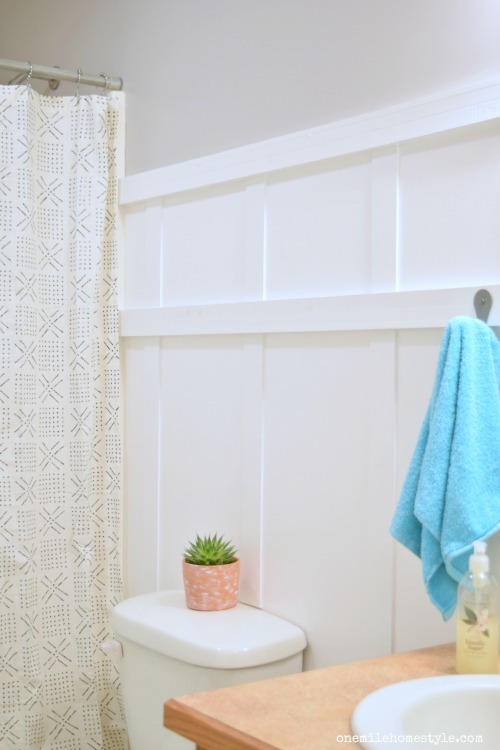 Love how this turned out and that board and batten is fantastic! What a transformation...I love it. I think that blue was the same color in the "before" pics of my daughter's room makeover. Great job. Amazing job, friend!! You did so great with that board and batten! Our girls' bathroom is laid out the exact same, so if I hadn't already redone their bathroom, I'd probably consider copying what you did! Thanks Erica! It is such a small space, it needed something to jazz it up! That is an amazing transformation!!! It is amazing what a difference just the paint and board and batten can make! It looks like a whole new room! Thanks Anika! It feels like a fresh new space too! What an awesome transformation!! The shower curtain is amazing - Target always comes to the rescue! I love it!! Thanks Kimberly! Target had some great ones on clearance too, but they just weren't quite what I was looking for! Ahh, I am experiencing board and batten envy! It looks so awesome. Isn't it great Kimm?! I have been wanting to try it somewhere, and this ended up being the perfect spot! I agree with Kimm. I need some board and batten in my life. You are so smart to have created a project check list. I need this for our next round in September. I love how your bathroom turned out. Thanks Lisa! The checklist helped me keep everything together, instead of random lists floating around everywhere! What a beautiful job! I love the bright bathroom. Wow! beautiful and Very clean looking bathroom. you did a great job.